Nach dem schönen aber schwierigen WoGE 132 von Péter Luffi, habe ich hier eins, daß ein bißchen einfacher sein könnte. Glaube ich zumindest. 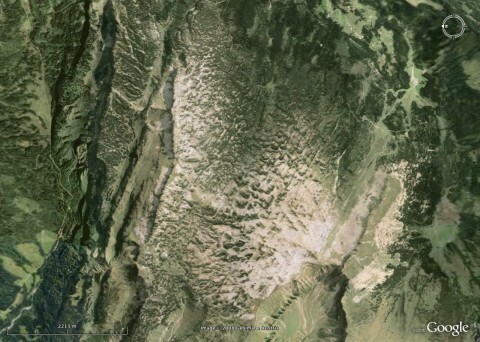 For any new players to Where on (Google) Earth, simply post latitude and longitude or a description of the location in the comment and write something about the geology. If you win, you get to host the next one. As I think it's not so hard to find, so I'll invoke Schott's Rule: former winners have to wait 1 hour for each WoGE they got right. Posting time is 22:50 CEST (20:50 UTC). PS: I have temporarily blacked out the copyright notice, as it might give away too much information. After the location has been found, I will restore it of course. After the WoGE has been found, I have now restored the original version. I still think "Gottesacker" ("God's acre") is a bit weird name. It's a really great view, but not quite like a graveyard. This area is one of the few parts in the Allgäu Alps where the Helvetic is exposed. In most places it is covered by the Flysch that has overthrust it and can be found to the north, east and south. Now, I'm already afraid of the new WoGE, which hopefully will be announced here soon. WoGE #134 is posted. No reason to fear 😉 Good luck!